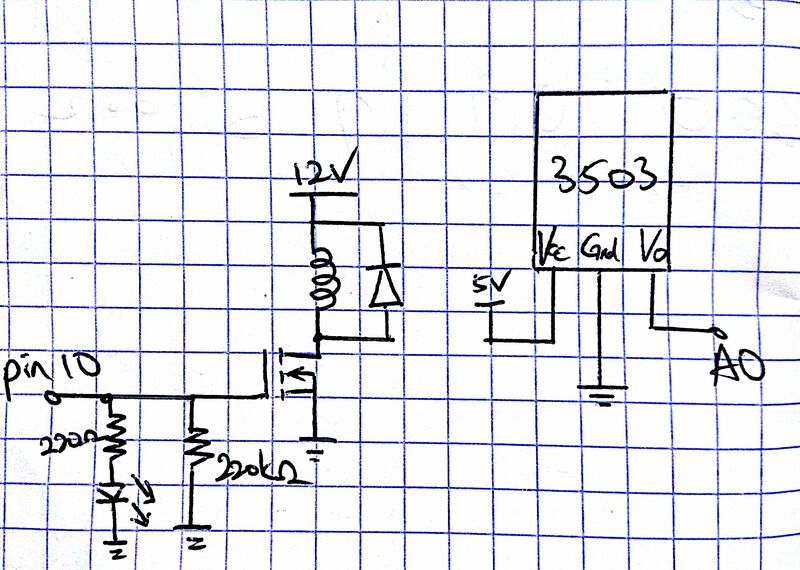 Actually I am using a FQP30N06L, but any N-channel logic level MOSFET should be usable. Connected to the Gate of MOSFET to switch it off faster. As an indicator for the strength of electromagnet. Any general purpose diode should suffice, it is to prevent the high EMF generated from the electromagnet from damaging the MOSFET, but my coil does't have high enough inductance to actually generate anything. Magnetic levitation fascinates me since I was a child. And the amazement never dies off even after I knew the working principle of the device. Hence, off I go creating a simple 'pull' type magnetic levitation project! My next plan is to make something similar to Levitron, a 'push' type magnetic levitator. The concept is quite simple: using the U3503 Hall Effect Sensor, the Uno is constantly measuring the magnetic field generated by the permanent magnet ( some neodymium magnets in my case). Then it calculates the error between the reading and my setpoint and feed the number to a PID equation, which then adjusts the strength of PWM output. The PWM controls the on-off of the MOSFET. Setup showing the magnets on top( for easier stability), the levitating magnets, and the sensor, connected through the red, blue and black wires. The sensor is put under the electromagnet coiled with enameled copper wire. Some magnets are put on top of the electromagnet to enhance the field. The hard part was to tune the PID values. However, the codes written by Reid Borsuk made it very simple to adjust the values. In fact, I just used his code directly, with my PID values. The back of the stand, showing the perf board I soldered to hold my components. I showed my crude prototype to one of my friends, and he generously designed a stand and printed it out with a 3D printer! Thank you very much! It is this simple! The MOSFET is controlled by PWM on pin 10. The output of Hall Effect Sensor is read by A0 pin. // Setup timer 1 as Phase Correct non-inverted PWM, 31372.55 Hz. //This seems pointless, but is used to deal with overflow in millis()'s output when downcast. If it overflows while in idle mode, it would stick in filter waiting for millis to go all the way back up to the last calculated point. //Can also set to type's min value to do the same thing, but now is more intuitive. //This is a weighted average function. It basically takes FILTERFACTOR samples, replaces one with the current hall sensor value, and averages over that number of inputs. //Print current settings. Also printed after any of the above cycles. //Why so complicated? Arduino doesn't include support for %f by default and requires an additional library, so we rip it open manually. Will not support negative numbers or indefinite precision. //This one line causes 3026 bytes of ROM to be used, almost half the sketch size...so if you run out of space, disable this (or simplify it). An electronics hobbyist very interested in the vast world of electronics.